... And also with you, MechQuest Fans! 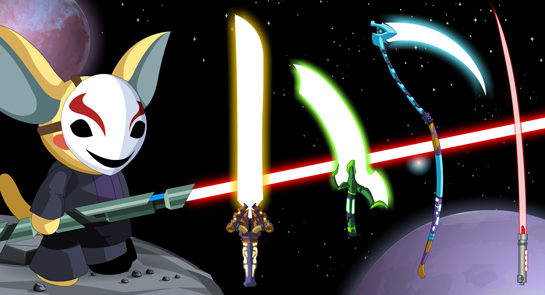 Head into AQWorlds and celebrate May the 4th with holiday gear imported all the way from the MechQuest universe! Find the items in the Featured May Gear shop in your game menu. MogWars comes to Lore lwith a pet based on my favorite monster from MechQuest -- Master Twang! Plus, we've got some deadly energy weapons we overclocked to help all you heroes defend yourself with against any monsters in the galaxy! May the 4th holiday... wait, what? "May 4 is considered a holiday by Star Wars fans to celebrate the franchise's films series, books, and culture as well as strict religious rituals. The date was chosen for the easy pun on the catchphrase "May the Force be with you" — "May the fourth be with you". Even though the holiday was not actually created or declared by Lucasfilm many Star Wars fans across the world choose to celebrate the holiday." Our May the 4th gear was imported from MechQuest, our *deep breath* single-player, browser-based, fantasy giant destructive war machine battle game. *exhale* WHOOOOSH that's a mouthful. Heavily inspired by the art from every mecha & giant robot series ever created, if you like battling in giant mechs, it's out of this world!